"It is nice to look up and see the pheasants strutting about outside, but the best thing about the shed is its absolutely quintessential smell of sheds." 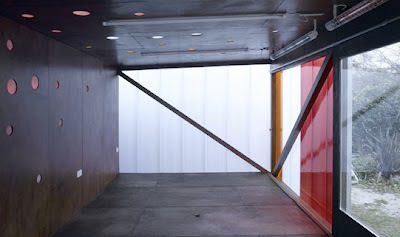 "Driven by an extremely challenging construction budget of only £15,000, the 25m2 building has relied on the use of a minimal materials palette to maximum effect. 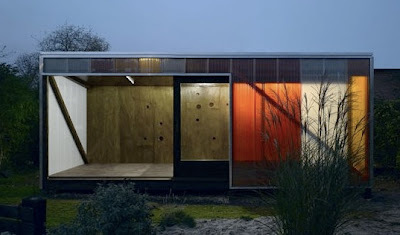 To this end, the building is comprised of a timber and plywood structure clad in translucent, colorful polycarbonate panels that reflect the ethos of the client organisation. 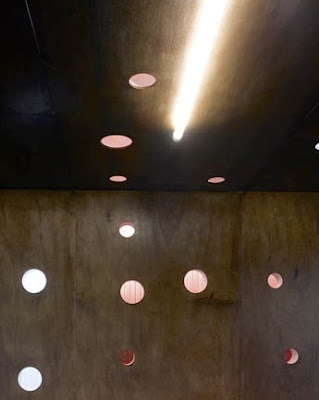 Apertures in the plywood provide pools of coloured light to the interior during the day, and glowing circles of colour to the exterior at night." We finish our week-long look at shedlike shelters with this splendid Octagon shelter from Sago Mokuzai, weighing in at just 40kg in its prepacked form. I'm afraid I can't read much of the site so if anybody who can would like to leave a comment, that would be marvellous. You've built your perfect shedlike atmosphere, it's ready to roll but there's one thing missing. A parking spot. 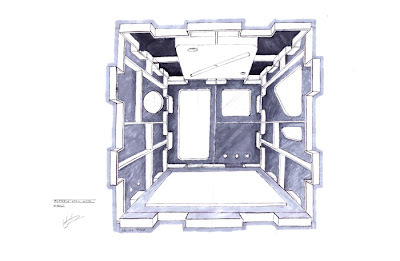 Michael Janzen at the estimable Tiny House Design is passing on a plea from Steve who is looking to park his tiny house near Washington DC, ideally close to the coast in Delaware, Maryland, or Virginia. If you can help him, there are contact details at the end of the video above. Even if you can't help him, it's a charming video to watch. 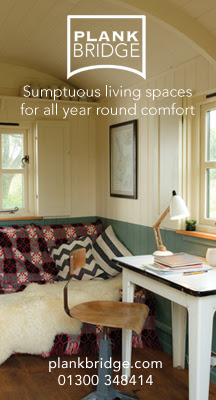 More details will be on Tiny House Blog in the next few days. 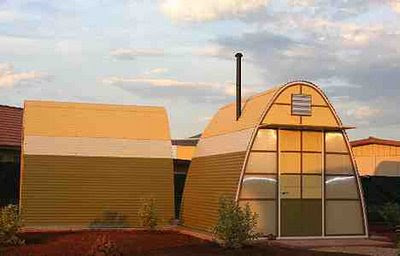 "There was a need for an alternative shelter to the typical tent solution that could transform a temporary living condition into a permanent home. 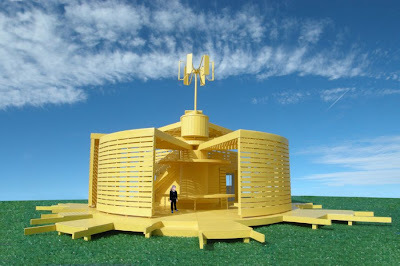 It is an inexpensive, efficient and easily realizable solution to the problem of housing people displaced by natural disaster, plagues, famine, political and economic strife or war. It has since become our aim to develop the project to serve not only refugees in disaster stricken areas but also as a modular, prefabricated solution to affordable housing everywhere that can improve people’s lives, the environment, society and even inspire greater diplomacy among the various cultures of the world." 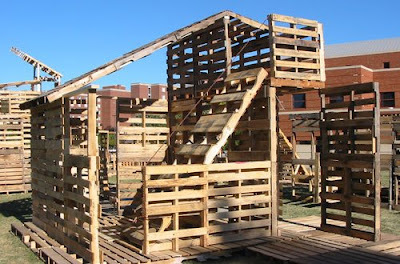 As you can see, it's built of wooden pallets (around 100 are need to make a 16' by 16' shelter). Lots more details and photos at the I-Beam site. 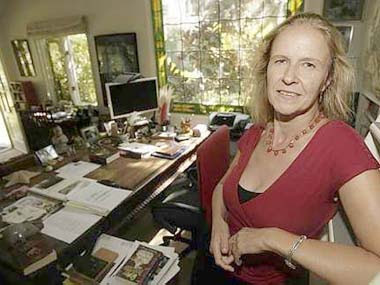 Cornelia Funke, author of the Inkheart trilogy which is also now a major motion picture, is a keen shedworker, working in what she calls her 'writing house' or Schreibhaus which is full of books and other treasured items, as well as apparently the occasional hummingbird. 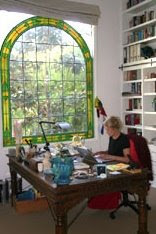 There are various photos of her at work at the Scholastic site here. 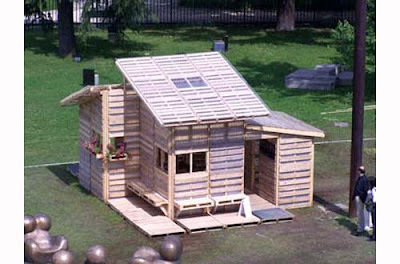 Paco: second house or garden office? 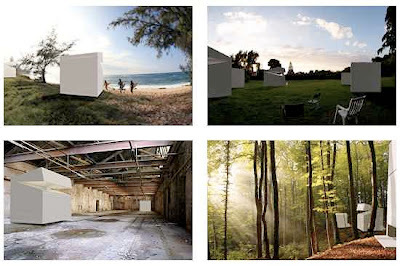 Paco is a 3m cube with elevating roof designed by Jo Nagasaka. 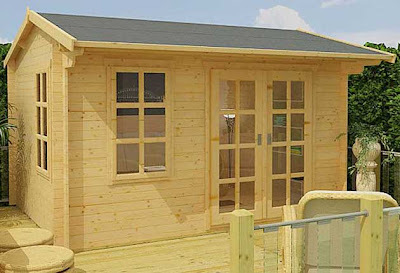 It's aimed at the second house market, but wouldn't it look spectacular in your back garden? 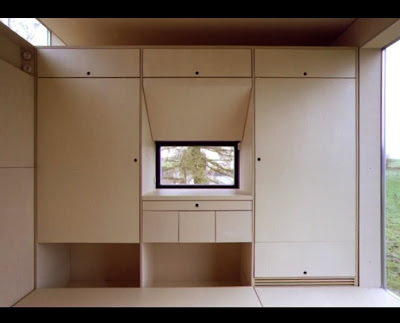 small second house"paco" by Jo Nagasaka+Schemata Architecture Office from architecturephoto on Vimeo. I also like the way they've seamlessly worked snooker into the lyrics. 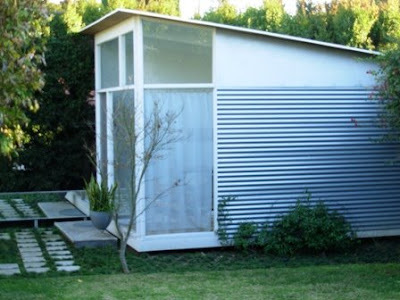 Continuing our week looking at emergency shelters on the Sheds for Everyone theme (see Monday's post for more details), here is Metaplate from Yong Sze Yuen Kelvin, a modular emergency shelter design which is expandable and can incorporate piping and drainage. "In thinking about where to put the office, I was reminded of how important it is to have rituals around the beginning and end of your day when you work from home. 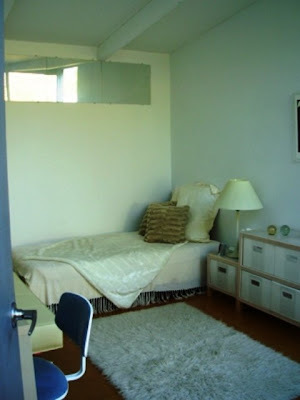 I believe that creating a space that enables me to have an opening and closing ritual to bookend my working day would really help me get going in the morning and switch off at night. Some people go for a walk around the block (with or without dog) to simulate the sense of “going to work”. 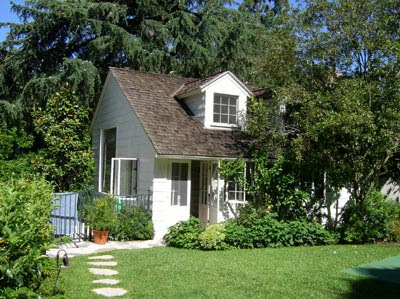 Shedworkers obviously leave their house to walk to their shed, which gives them a leaving and returning ritual to observe." I wondered what homeworking rituals readers have? Please share them in the comments below. Here's one to start you off: I always make sure I am wearing shoes and socks in the garden office as it makes me feel more workmanlike. Slippers, while comfortable, encourage me to selfdistract. 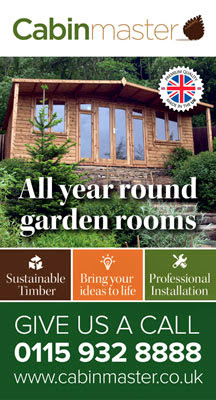 If your garden office is still not entirely paperless, perhaps this will help a little. 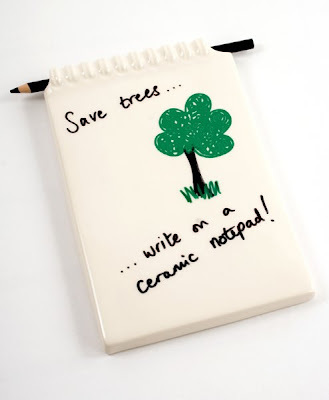 It's a ceramic notepad from Yoyo Ceramics. It comes with a special waxy pencil which easily wipes away and you can buy red, blue and yellow ones if you get tired of black. Comes in any size you like as long as you want it approx 15cm x 21cm x 1.5cm. And unlike your moleskin notebook, its dishwasher proof. 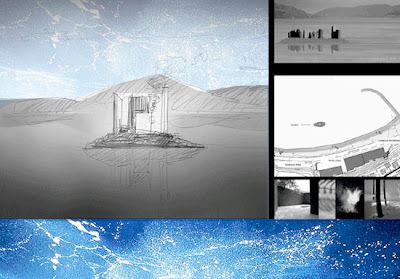 "Whether by war or natural disaster, when thousands of homeless people need reliable, cheap, portable shelter, temporary emergency structures may provide simple, easily assembled and biodegradable solutions. 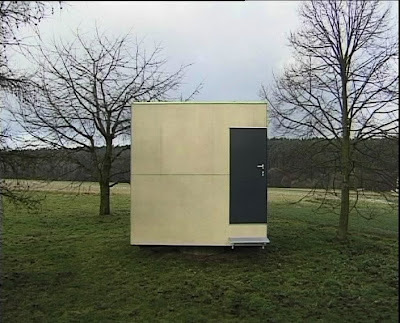 In addition to putting a roof over a person's head, this emergency shelter provides storage for some personal belongings, some privacy, and a clearly delineated sense of personal place for each user." This started out as a twitter entry where I said "lavardera like to see small prefab house setup like laptop for every child.If you buy one as a shed, you also buy one for family in developing nation." Well actually it started out before that on facebook where my friend Jonii asked me one day last week "Did you see my post about that Paper House? What do you make of that?" 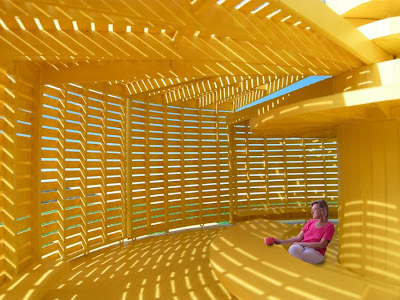 Jonii has been on a multi-year quest for a small modern house, prefab or otherwise, and she looks at all the new proposals that come across the internet. 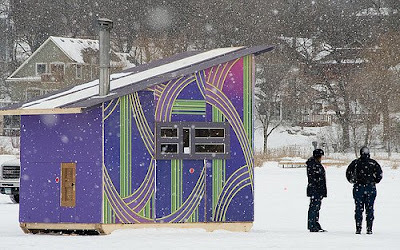 So her question about the Paper House which made the rounds on the design blogs this month seemed like another dead end for her. I responded that it looked like a very interesting proposal, but it seemed to be aimed at the developing world more so than the USA. That's when it struck me - why can't we do both. 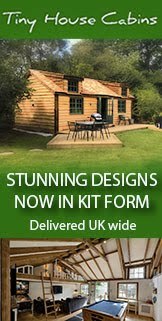 Why can't we create a product that would at the same time appeal to shed buyers in the USA looking for a garden office or guest space, and also make an ideal dwelling for a developing nation? 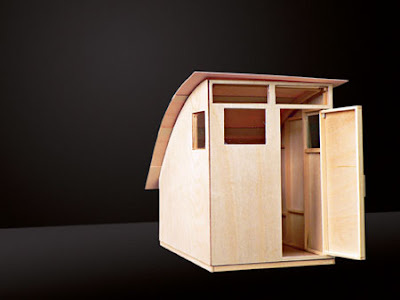 I'm an architect and I love to design, but there are so many great shed products on the market, and so many clever proposals in this space that I have to believe the ideal product is out there such as The Paper House we saw this month or the award winning Abōd® (pictured above). The design is important no doubt. It has to be something that was conceived to be easy to build in a developing nation. But appropriate designs are out there. What is needed is the organization to make something like this happen. A design must be adopted and the business model set up. But who would take on something like that? Perhaps the foundation that is already running the One Laptop Per Child program? They already get the concept, they understand the business model. Why could they not expand into this worthwhile space? 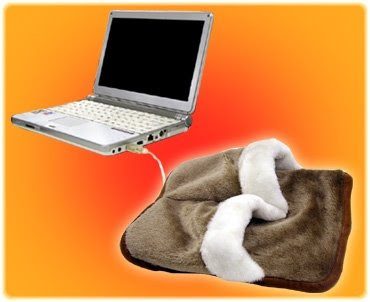 Or some other aid agency that can follow the model already established in the laptop program. 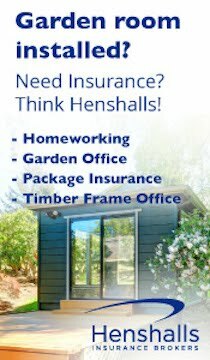 Buy a shed, give a home? Please do leave your thoughts and comments below. 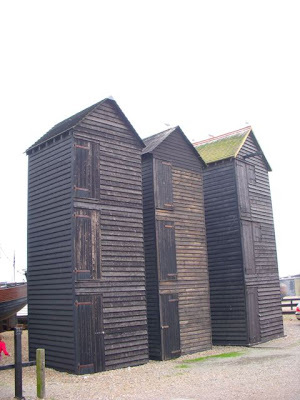 "The tall black wooden sheds close to the Museum are the ‘net shops’, built as stores to keep fishing gear dry. They are unique to Hastings, and are beloved by artists. In early Victorian times they were laid out in these narrow rows with very limited ground space because the sea then used to come up to where the miniature railway line is today. They are up to 30 feet high, and many have cellars. 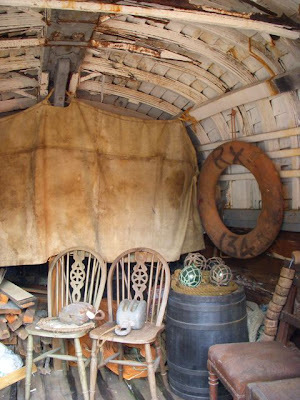 Scores of nets made of natural materials would be hung up inside, along with ropes and chains. 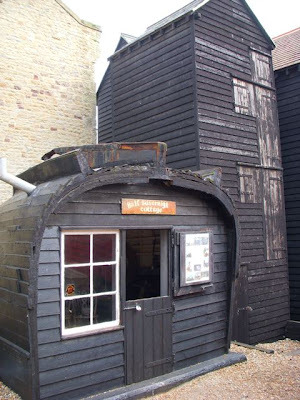 The Museum has a display inside the net shop next to the Museum door, and has also made two net shops from a cut-up Hastings boat." The museum is pictured above and below. Photos by Elspeth Thompson. This week, Emma Jones from Enterprise Nation looks at the topical subject of money (I've noticed on Twitter that a lot of shedworkers are in the midst of doing their tax return this week...). I often speak about the golden triangle in business. This is the simple triangle that helps to keep your head and your business in order. It goes like this; try to spend equal amounts of your time on three things - business development, customer care and admin - if you spend roughly a third of your time on each, the business will balance. There will though be a corner of the triangle you don’t enjoy. If you’re like me, it’s ‘admin’ – the canny corner that involves distributing invoices, monitoring cashflow and generally keeping the books in order. The good news is, there’s help at hand for each corner of the triangle, including support with your admin and accounts. A number of online services have come to market, particularly aimed at the freelance community. They include Free Agent Central which, in a review of online invoice applications by our freelance technology editor, San Sharma, was described as “more than an invoicing app - it's the closest thing to a virtual accountant that I've ever seen and, far from those services on my original list, it's British! That means it’s easy to report Sales Tax, VAT, business and personal taxes.” Other options for online invoicing include Freshbooks, Simply Invoices and Cashboard with more comprehensive accountancy products such as Intuit’s Quickbooks also available. To receive an even deeper level of support as a freelancer, you can register with an umbrella company. This essentially outsources all of your admin with tasks like invoicing, collecting payment and paying taxes taken care of by the umbrella business. You have your own clients and continue to enjoy the benefits of being self-employed, whilst your status changes to an employee, with someone else taking care of the support required. Companies such as Kingston UK and Brookson are leaders in this field. Central to the services offered by all of these support businesses is that they take care of the money, so you can spend more time generating it. Which has got to be good news! 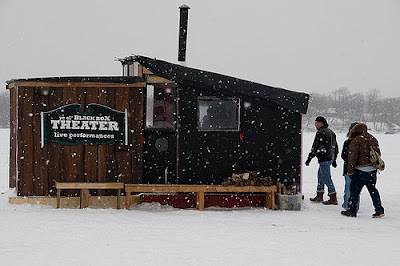 A six-week exhibition of performance, architecture, science, art, video, literature, survivalism and karaoke, ASP is part sculpture park, part artist residency and part social experiment, inspired by traditional ice fishing houses that dot the state’s lakes in winter. 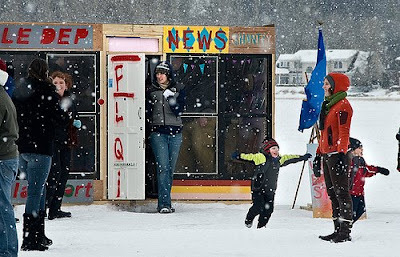 Which sounds marvellous but still doesn't do justice to a true community carnival of shedlife. 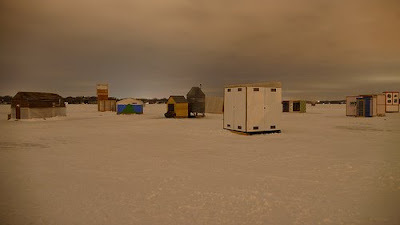 Among the shanty stars are ones made of paper, the only Post Office on ice, the Black Box theatre, one devoted to family games, another to Shackleton's journey to the South Pole, a specialist knitting shanty, the Ship in the Bottle Shanty, The News Shanty and many, many more. A few examples above and below but hundreds more at their Flickr site. Well worth a browse. Some of you may know about spotify, an online streaming music site which features a huge amount of music of all types (more details here). At Shedworking HQ we're hooked on it and one of its greatest features is that you can come up with collaborative playlists, a little like a mixtape which everybody can add to. We've started one off on a shedworking theme which you can view by clicking here (though you need to be a member to join and at the moment it is invitation only I think - I have a few invites so let me know if you'd like one). And not only can you view it, you can add to it. So please, start adding. It's time for a new regular post and it's going to be a quiz, Name That Shed. Each Saturday I'll be putting a new shed up and you have to try and identify a) where it is and b) what it's for or who it belongs to. Here's the first, a lovely photo by Elspeth Thompson. Answer on Monday. According to Helen Crump in the Health Service Journal, homeworking (and I assume shedworking), green travel plans and low carbon commissioning will feature in the NHS's first carbon reduction strategy plans to be announced next week. She adds that the document is also likely to "include measures to ensure the whole NHS adopts a greener way of working. These are likely to range from large scale changes such as writing carbon reduction into commissioning frameworks and local area agreements to individual actions such as working at home to cut transport emissions". 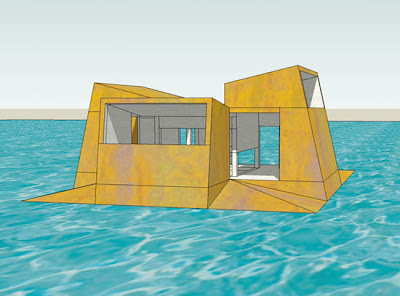 "Trad is a shelter, a personal space where children carry out their fantasies and games. 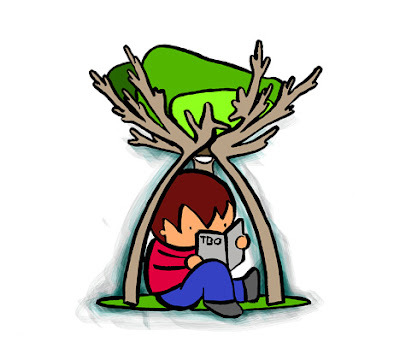 A place that allows them to feel safe, to learn and to imagine. That enchanted wood where one can dream of heroes and princesses, witches and dragons... and live a thousand and one adventures. 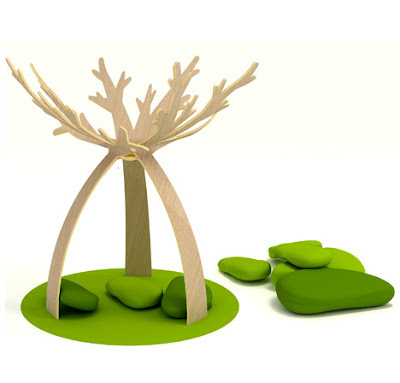 The tree, as an icon for wisdom, shelter and playground, symbol of life and growth. Approach to an increasingly absent nature, as a comeback to traditional games, towards imagination development, with no artifices, as a basis for the growth of the child's personal world." "I really love (my shed). Sometimes, when I’m overly pressured, I just go out here and look around, listen to the gravel crunch under my footsteps, pick up a leaf or two, lean on the wall, look at the sky. 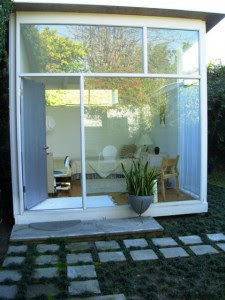 Gaze at the view of the garden from inside the little room." Chris Evans did a great job of getting the 2009 National Shed Week bandwagon rolling yesterday on his BBC Radio 2 drivetime show with an excellent segment featuring interviews with Uncle Wilco (who managed to namecheck Shedworking and our staff) and Sarah Beeny who quite rightly pointed out that "There aren't enough sheds in the world" before intriguingly admitting that her favourite shed was her potting shed even though she'd never potted in it. If you missed it, then you can Listen Again to it at the Radio 2 site here. Both Uncle Wilco and I mentioned it on twitter yesterday which is a great place to keep up with breaking shedworking and shedlike atmosphere news easily, simply by 'following' us. 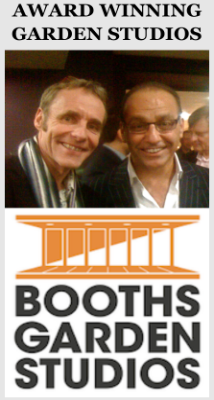 If you're around at 5.25pm today, then tune it to Chris Evans BBC Radio 2 show when he will be talking about sheds and National Shed Week with Uncle Wilco (NSW organiser and the brains behind Shedblog and readersheds.co.uk) and property guru and general all round nice property person Sarah Beeny. 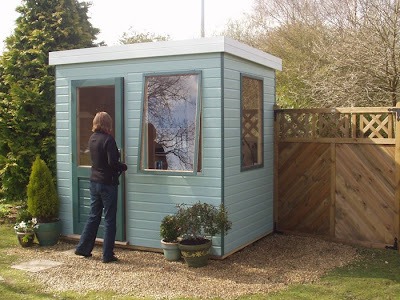 We've mentioned Henley Garden Offices a few times before on Shedworking, but here's their newish Solus model at 2.4m x 1.8m x 2.3m high (i.e. 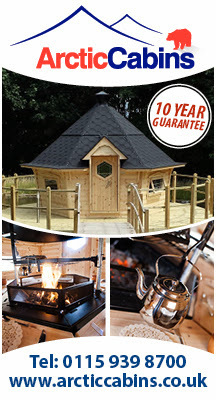 designed to improve your chances of not needing planning permission) which comes either as a selfbuild or with professional assembly options. You can get 15% off the price too by ordering a free brochure pack. 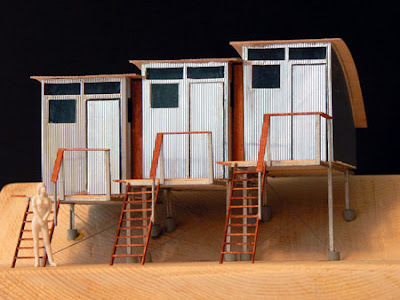 A nice piece about putting together a home office in The Independent by Kate Watson-Smyth also takes a brief look at shedworking and features this model, above, from Garden Buildings Direct. 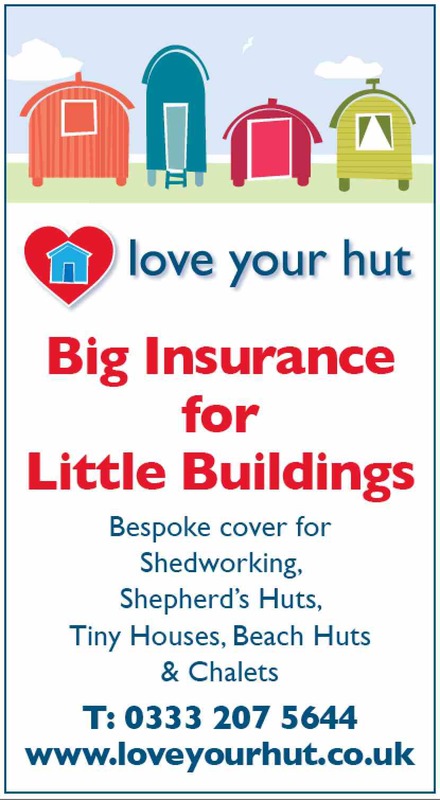 There's some hidden link love in the article so if you're coming to Shedworking for the first time, you're very welcome and please do leave a comment. 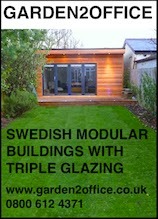 Mark from Garden2office has put together this rather impressive time lapse video of a garden office being constructed. 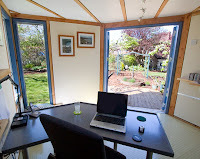 He'll also be putting on a kind of workshop on garden office construction in Ireland early next month, details coming shortly on Shedworking. 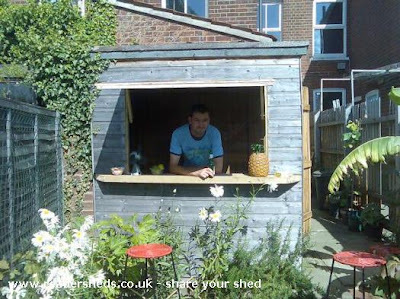 Martin, shedworker and owner of the Smallbeerfruit on the Beach shed in Norwich will be on Radio Norfolk today at some point just after midday. I'm particularly intrigued by Martin's shed for various reasons: he built his shed from salvaged timber, he uses it as a work area, and it doubles as a pub shed (not to mention quoting George Borrow, a kind of Victorian cross between Errol Flynn and Billy Graham). You can take a virtual tour of the White House at The Independent site. With echoes of the m-ch, Jan Sturm's intriguing Cuberotate focuses on the idea of a house being made up of little cubes, each with wellinsulated wooden walls, pretty much self-sufficient in terms of energy with its photovoltaic panels. 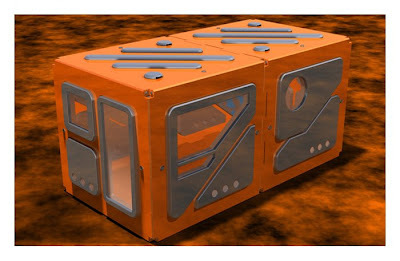 It has folding and pull-out furniture so the whole thing become a multi-tasking live-work atmsophere. 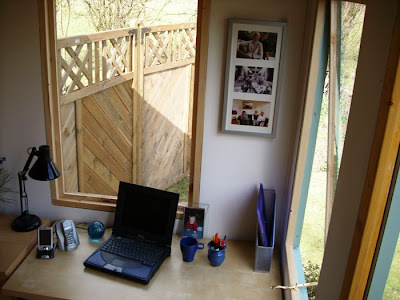 And if you want to change your views, you can rotate the whole darn thing by hand like George Bernard Shaw's garden office, one of Shedworking's pet loves. For her latest column, Emma Jones from Enterprise Nation looks at making the most of that one chance to create a first impression. To make sure it’s the right one, follow these 7 steps that will have people meeting you, liking you and, critically, wanting to do business with you. 1. Be confident – walk into a room with your head held high and confidence intact. This will come across clearly in your posture. Shake hands firmly and look the other person in the eye when introducing yourself. If someone is coming to collect you from a waiting room, remain standing whilst you wait – no matter how appealing the sofa looks! 2. Look the part – are your shoes polished and hair brushed? This may sound like a small thing but potential customers will look for the detail. The state of your appearance and dress could make the difference between winning a contract, or not. If you can, check yourself in the mirror just before greeting; it’s the safest way to avoid sitting through a vitally important meeting with cappuccino froth on your lips! 3. Good design speaks volumes – ensure your personal image is reflected in your professional image. Do you have a memorable logo? And does that logo appear on business cards, your website and other promotion materials? Company design can make you stand out and it’s worth paying a professional to get it right. 4. Take an interest in the other person – creating a good impression is about listening to the other person, as much as it is telling them about you. Ask questions about their business, hobbies, life and they, in turn, will take a deeper interest in yours. It’s also through asking questions that you’ll find common points of connection. 7. Follow-up – back in the home office and it’s time to follow up on the actions agreed. Be prompt and the relationship will progress just so. Taking these steps will ensure you create the right impression and that your business is regarded as professional and trustworthy. What better way to secure new customers.